Burger King re-launched in Israel yesterday (Monday), 13 years after its first, failed attempt at competing with local Burgeranch and global McDonalds, and 5 years after shutting down its activities here. This time around, Burger King is facing another rival, one who doesn’t serve charred meat patties – a vocal animal rights activist base, which grew popular through internet communities, Gary Yourofsky lectures, the organic food trend and the local Big Brother show, which featured a prominent animal rights activist. There are many animal rights activists and movements in Israel, some more militant than others, like 269life and Animal Liberation Front (ALF). 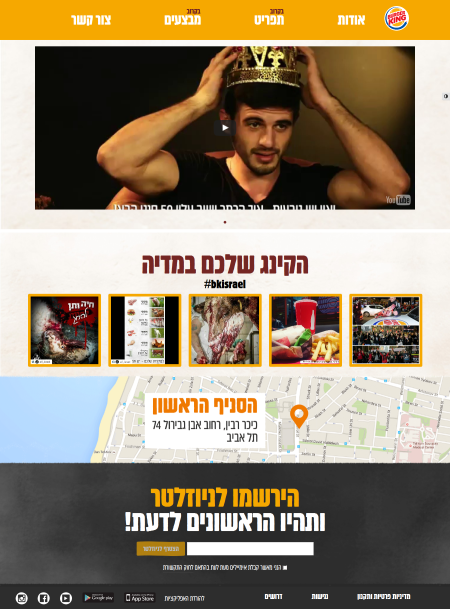 Burger King Israel’s website is pretty basic – a bunch of generic about/contact/social media links, “coming soon” plastered on its “menu” and “deals” links, a video ad, a map of the first, and currently only, location, and a newsletter sign-up box. In the middle of the homepage, under the headline “Your king in the media #bkisrael”, are four user generated photos tagged #bkisrael, automatically pulled afresh from Instagram each time the site is loaded. Do I need to spell out who hijacked that hashtag and flooded it with gruesome photos of slaughtered animals and anti-carnist slogans? OK, it’s the militant animal rights activists, some of whom also demonstrated in front of the restaurant on the opening night. So right now, BKI’s site is featuring photos of dead animals, and not in the denial-convenient-disc-shape its customers are accustomed to. Any social media manager, let alone an Israeli one, should have known better than to allow unfiltered UGC on a meat-merchant’s site. What’s worse is, they’ve been informed of this by netizen Or Ben Zvi Reif‎, acknowledged it 20 minutes later, and STILL haven’t done anything three hours later. So the good news is, if you’re looking for a social media managing gig in Israel, one might open real soon. [Update, Feb 3, 13:52] BKI replaced the automatic photo feed with five photos from its Instagram profile. While the site continues to present the photos as being part of the #bkisrael hashtag, not one of them is tagged with this hashtag.